After graduating from Durham University with a 2:1 Honours degree in Geophysics with Geology, I went on to gain a Masters degree in Geotechnical Engineering from Newcastle University. 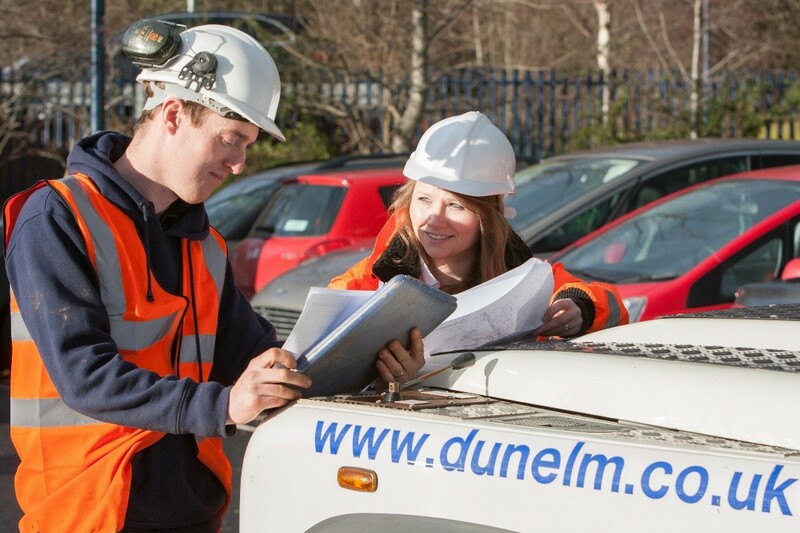 After initial years based on site, I am now a senior engineer and project manager at Dunelm Geotechnical and Environmental, specialising in geotechnical design. I work on a wide range of project across the country, providing geotechnical support and interpretation. I was the winner of the Cooling Prize in 2014 for a paper I wrote on Lindisfarne Castle; a Rock Mass Stability Assessment. What or who inspired you to join the geotechnical industry? At school I was always interested in Geography and Physics/Engineering, so my undergraduate degree in Geophysics with Geology seemed the natural choice. I wanted to combine my love of fieldwork and the outdoors with numerical skills, and as I learnt about geotechnical engineering as a possible career choice, it was a perfect fit for me. My Masters degree further fuelled my enthusiasm, and I embarked on a career as a geotechnical engineer! Every project is different, so every day is different; that’s the best part about being a geotechnical engineer. Much of my day to day time is spent planning and managing geotechnical investigations and undertaking geotechnical designs, including shallow and deep foundation design, mining risk assessments, settlement calculations and slope stability assessments. I also mentor junior members of staff progressing towards chartership via our accredited CGeol chartership scheme. Encouraging junior members of staff to progress their careers in our industry is rewarding, and I enjoy discussing with them the different avenues down which they could go. I also visit schools and universities to talk to the students about the career opportunities within the geology sector, and promote how it can be a challenging, interesting and rewarding career choice. We need keen, motivated students interested in geology to take an interest in our industry, as without them, we would face a skills shortage in the future. Are there any projects which you’re particularly proud to have been a part of? I was awarded the Cooling Prize in 2014 for a paper I wrote on Lindisfarne Castle; a Rock Mass Stability Assessment. Lindisfarne Castle is a National Trust Property in Northumberland, and an important tourist attraction for the region. This historic landmark was under threat from instability, caused by the degradation of the Whinn Sill dolorite rock outcrop on which it is built. I was involved in collecting field data on the orientation of the joint sets within the outcrop, which plotted onto stereographic projections. Rock mass failure mechanisms were identified for each side of the outcrop, showing how the outcrop may degrade over time. The joint structure was concluded to be resulting in wedge failure or toppling failure occurring, potentially leading to instability in the castle if untreated, as well as potential health and safety risks for the public using the paths below. Our Rock Mass Stability Assessment was invaluable in planning the remediation and preservation of the rock mass, and therefore the castle, and I am proud to be involved in the conservation of such a prestigious landmark. What are the most challenging aspects of your role? No matter how much desk top research has been undertaken, you can never be sure what to expect from the ground conditions on a site until the site investigation has started. There could be an unrecorded backfilled opencast coal mine with no records, or unexpected artesian water. These are the reasons we do ground investigations in the first place, as the developer needs to know about unforeseen ground difficulties before finalising designs, however, they can make management of projects difficult, as they affect time scales and equipment needed for a job. The job would not be as interesting if every site investigation found exactly what was anticipated! What AGS Working Group(s) are you a Member of and what are your current focuses? I am currently a member of the AGS Senate, planning the overall running of the AGS, and discussing the findings of each specific Working Group. We also discuss how the industry as a whole needs to progress, and what standards or guidelines would be useful to develop. The AGS also hosts a number of conferences throughout the year, and we focus these to cover the topics and issues the Working Groups have highlighted to be at the forefront of the industry. What do you enjoy most about being an AGS Member? I enjoy having an input into the progression of the industry as a whole, and giving back to the profession. We need to ensure the industry moves forward, and the AGS provides a platform from where this can happen. The Senate and Working Groups cover the topics at the forefront of the industry, and I enjoy the opportunity to discuss industry wide concerns with peers from other companies. What do you find beneficial about being an AGS Member? The AGS offers a great range of guidance documents, which are concise and up to date with current standards. The AGS guidance documents are accessible to read, and useful for engineers at all levels within our industry. AGS data is an invaluable tool for sharing and analysing results in an accurate and time efficient manner, and has helped bring the industry into the 21st Century. Why do you feel the AGS is important to the industry? The AGS provides a platform from which professionals within the industry can share ideas and develop best practice. We can learn from common mistakes and successes. The AGS provides a united front acting for the whole industry, providing advice and guidance on the topics members feel are most important. The AGS membership directory is also a valuable tool for potential clients to find suitable geotechnical and geoenvironmental specialists. What changes would you like to see implemented in the geotechnical industry? The importance of a comprehensive site investigation is sometimes undervalued by clients, with limited budgets allocated compared to overall project value. This can make it difficult to undertake an investigation to best practice current guidance. A general appreciation of the industry as a whole would result in better site investigations, and would allow projects to run more smoothly, and potentially more cost effective overall. The AGS’ work in promoting the industry will hopefully see the imbalance corrected for the future.